Whats in your Easter Basket? He can't eat dairy ( neither can his Sis any other day) and is becoming more and more sensitive to wheat like his Mummy. 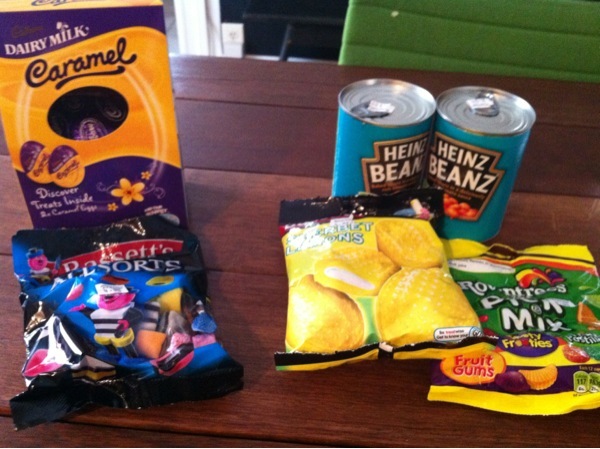 We took a quick jot over to Myers (Brit shop) for some Easter treats.
" I don't want a chocolate egg Mum - it will hurt my tummy, I'm happy with my fav baked beans and some boiled sweets". Ruby on the other hand decided to embrace the tummy ache with a Caramel Egg. Me - I will make some coconut macaroons thank you very much. Whats in your Easter basket, Dairy or not?